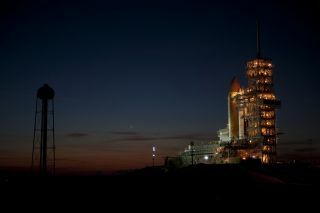 It's almost time for the final voyage of NASA's space shuttle Discovery. Top NASA officials are meeting today (Feb. 18) to set an official launch date for Discovery's last mission – which is slated to blast off next week. A big item on the review docket is whether adjustments need to be made to Discovery's launch schedule to accommodate other cargo craft heading to the orbiting outpost. The European Space Agency's Automated Transfer Vehicle-2 launched Wednesday (Feb. 16) from the northeast coast of South America after a one-day delay due to a technical glitch. The ATV-2, called the Johannes Kepler, is now in the midst of an eight-day journey to the space station to deliver about 7.1 tons (6,400 kilograms) of supplies. Discovery is targeted to liftoff from NASA's Kennedy Space Center in Cape Canaveral, Fla. on Feb. 24, the same day that the ATV-2 Johannes Kepler is now scheduled to arrive and dock at the space station. Initially, NASA officials thought the space traffic jam would force mission planners to delay Discovery's launch by one day – to Feb. 25. But, NASA officials announced Wednesday (Feb. 16) via Twitter that the launch of Discovery's STS-133 mission will not necessarily be moved. This was also confirmed early on in today's meeting, where live updates are being provided through Twitter. "Shuttle program, Mission Ops flight directors and all [Flight Readiness Review] attendees agree STS-133 can launch 6 hours after ATV docks on Feb. 24," NASA officials reported this morning via Twitter. Discovery's STS-133 mission is an 11-day flight to deliver a humanoid robot and a new storage room to the International Space Station. The mission has already been delayed months because of fuel tank problems. It will be the final flight of shuttle Discovery before NASA retires its three-orbiter fleet later this year. Meanwhile, the astronauts who will fly aboard Discovery enjoyed a day off yesterday before entering quarantine in advance of the launch. Last week, space shuttle program managers met and unanimously agreed to proceed toward the orbiter's targeted launch. Officials also discussed the possibility of adding a bonus photo session to the flight, in which the Russian Soyuz capsule will undock from the space station and fly around to snap photographs of Discovery while the ship is docked to the fully completed orbiting lab. The unique photo opportunity is being discussed during today's Flight Readiness Review (FRR), but the latest Twitter update from the meeting confirmed that a final decision on the matter will not be made prior to Discovery's launch. "All partners will have a vehicle docked to ISS during STS-133 - decision for Soyuz fly about for pics will be made during flight," NASA officials said via Twitter. The results of today's Flight Readiness Review, including Discovery's official launch date and time, will be announced during an afternoon press conference that will be broadcast live on NASA TV. NASA is retiring its three-shuttle fleet this year after 30 years of spaceflight to make way for new exploration plans that call for sending astronauts to an asteroid by 2025 and to Mars in the 2030s. Once the shuttle fleet retires, NASA will rely on unmanned spacecraft built by Europe, Russia and Japan to deliver cargo to the space station until American-built commercial spacecraft become available. A gap of several years in U.S. human spaceflight capability is also expected. The U.S. agency will use Russian Soyuz spacecraft to ferry astronauts to the orbiting laboratory until American commercial crew vehicles are ready. Space shuttle Discovery is NASA's oldest space shuttle still in operation. Its final voyage to the space station will be NASA's 133rd space shuttle mission since the fleet began flying into orbit in April 1981.